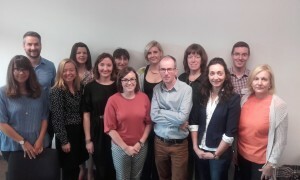 Dr Jenny Mc Sharry was awarded an Irish Research Council New Foundations (2015) grant to increase implementation science capacity in Ireland through the development of the IMPlementation science Resource NeTwork (IMPRNT). IMPRNT was launched on 19th September at a one-day Workshop with national and international speakers. On 20th September, Jenny chaired a consensus meeting with national and international members on how best to develop IMPRNT to build implementation science capacity.